I went for an interview today at Microsoft Canada's Head Office in Meadowvale, Ontario. I walked in and had my photo taken by a webcam, entered a few details and it produced an instant ID card for me to use. The interview went well and on Monday I will start my new job at Microsoft. 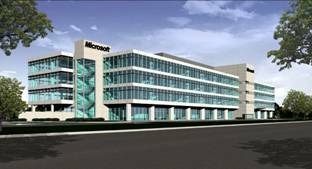 I'll still be working for Navantis, but I will be based at the Microsoft Canada Head Office with all the benefits that brings. I have a bit of a commute, but this will be temporary as I am planning to get a car once I have my latest work visa. The office is great and we even have our own Starbucks. It's also near to a Mall and there are plenty of options for lunch, including the canteen that has lots of choice. I will be responsible for updating Microsoft.com/Canada as well as other Canadian Microsoft sites. Navantis has agreed to make me a full-time employee too with all the benefits that brings, but we are still working on the details due to my work visa status etc. Welcome to Microsoft / Navantis. We have a great photography club, it would be awesome to have you involved given your great work. Please make contact once you get settled in Meadowvale. .NET 2.0? Or 3.0 they're gonna be calling 2.1, I dunno. Ooops, sry your now MS...hehe! Well done Sir! I'm glad this is working out for you. Believe it or not I have also had some nice news, I am being trained to be the backup systems administrator for the Library Management System (Unicorn - produced by Sirsi-Dynix) for the entire HSE. Imagine that, me with responsibility for a nationwide system... not quite as impressive as you though. A Christmas card is on the way!